Don your tiara to feel like a princess and bundle up for a night at the SnowCastle! Located in the town of Kemi on the cold Finnish waters of Bothnian Bay, the castle has been reconstructed every January for over 20 years using seawater-converting snow machines. This massive structure is usually between 13,000 and 20,000 square meters and is open from January through April, depending on the weather. 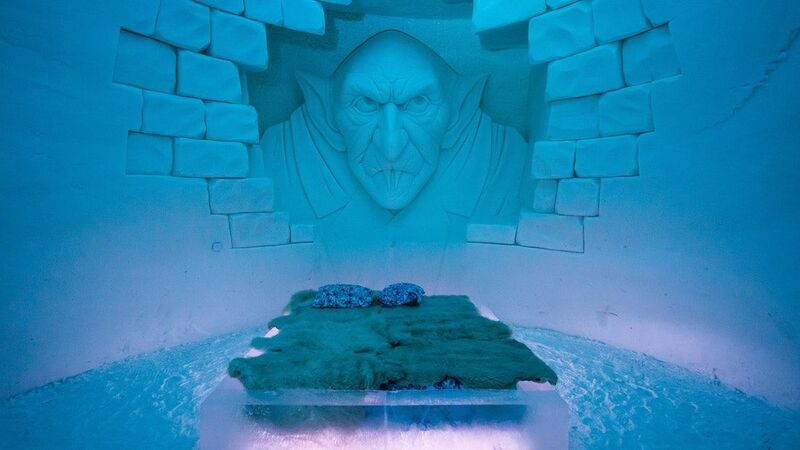 Rooms have intricate snow carvings and a bed with a lambskin cover and a sleeping bag designed to keep you warm in the -5°C temperature. Venture out of the SnowCastle to experience traditional ice fishing or explore the neighboring islands and the Northern Lights via nordic skis, snowmobile, fat bikes, or snowshoes. Journey to lower Lapland for a unique adventure at the SnowCastle!